Optimum Infinite is the first GP contact lens material with an oxygen permeability of over 200 Barrer to be approved by the FDA. Introducing Optimum Infinite in Las Vegas, the home of gambling, has a certain irony as new products are never guaranteed to become popular, despite years of rigorous development. There are, however, several good reasons to think that the wider speciality contact lens industry will share Contamac’s huge excitement over this new material. The development of Optimum Infinite happened in large part because of feedback from the contact lens industry through forums such as KOL meetings, site visits and trade shows. A common message was the need for a material which is specifically designed for use in scleral and ortho-k designs. For a material to be well suited for use in these modalities it is important to have both good resistance to flexure (high flexural modulus) and a high oxygen permeability (Dk). This would enable lenses to perform effectively in a wide range of designs while maintaining eye health through maximising Dk/t. Most current GP materials were, however, developed for standard corneal applications and so these considerations would not have been prioritised. As a result, the R&D team at Contamac were given the task of developing a new GP material which combined exceptional oxygen permeability and flexural strength, without compromising other important properties such as lathability, wettability and scratch resistance. It is widely believed within the contact lens industry that with GP materials the higher the oxygen permeability, the more likely there will be problems with wettability, scratch resistance, flexure and lathability. These observations arise because the two main ingredients which have been used to increase oxygen permeability in current GP materials, TRIS ((3-Methacryloyloxypropyl)tris (trimethylsiloxy)silane) and PDMS (modified polydimethylsiloxane macromers), tend to be detrimental to hardness, flexural modulus and hydrophilicity. By moving away from TRIS and PDMS in the development of Optimum Infinite, Contamac found ways to prepare polymers which combine unprecedented oxygen permeabilities with good resistance to flexure. Once the high-Dk–low-flexural modulus paradigm had been broken the project could focus on maximising wettability so that patients would be pleased with the level of on eye comfort and on ensuring that contact lens manufacturers would find the new material scratch resistant, easy to lathe and of the highest optical quality. 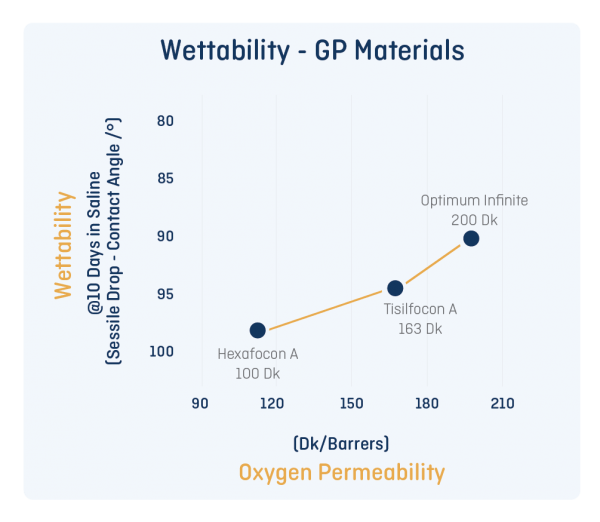 Optimum Infinite combines an oxygen permeability of 200.4 barrer (independently measured by Dr. William J. Benjamin of Material Performance Assessments, LLC) and a flexural modulus of 1341 MPa. This equates to being among the most rigid of the contact lens polymers, and having an oxygen permeability double that of many popular GP materials, potentially bringing significant eye health benefits, particularly for patients with compromised corneas or with thicker lens designs. These factors make Optimum Infinite ideally suited for scleral and ortho-k applications. Furthermore, the excellent wettability of Optimum Infinite, which is shown by a sessile drop contact angle of 90.7°, and which can be further enhanced through Tangible Hydra-PEG coating or plasma treatment, means that it should work extremely well as a standard corneal lens. The resting Shore D hardness of 80.7 indicates that Optimum Infinite is a relatively hard material bringing good scratch resistance and lathability to the product. There has already been positive feedback from customers about the optical quality, wettability and lathability of Optimum Infinite. Comparison of the sessile drop contact angle of Optimum Infinite and other RGP polymers (data generated by Contamac using a Kruss drop shape analyser). Practitioners have raised concerns about whether hypoxic stress will result from long term wear of scleral designs due to being thicker than corneal lenses and having a greater tear reservoir. Back in 2012, Langis Michaud published a model for calculating the minimum oxygen permeability that would be needed in a material used for scleral lenses to maintain eye health¹. According to this study, given that scleral lenses are fitted at 200 microns clearance and have a typical thickness greater than 300 microns, the minimum Dk that is required for a scleral lens material is around 180 barrer. Of the FDA approved GP materials this value is only met by Optimum Infinite (with its Dk of 200). In practice, a patient with glaucoma, rheumatoid arthritis and chronic sarcoidosis may already have benefitted from raising oxygen permeability to such a high level. When their extended wear GP lens was swapped from a 125Dk material into Optimum Infinite there was a reversal of both endothelial bleb formation and corneal edema accompanied by significant improvements in visual acuity and comfort. Moving on from the launch at GSLS Las Vegas 2019, Contamac hope that for contact lens wearers Optimum Infinite will hit the jackpot, and these early clinical findings give weight to that belief. 1. Predicting estimates of oxygen transmissibility for scleral lenses. Langis Michaud∗, Eef van der Worp, Daniel Brazeau, Richard Warde, Claude J. Giasson. Contact Lens & Anterior Eye 35 (2012) 266-271.